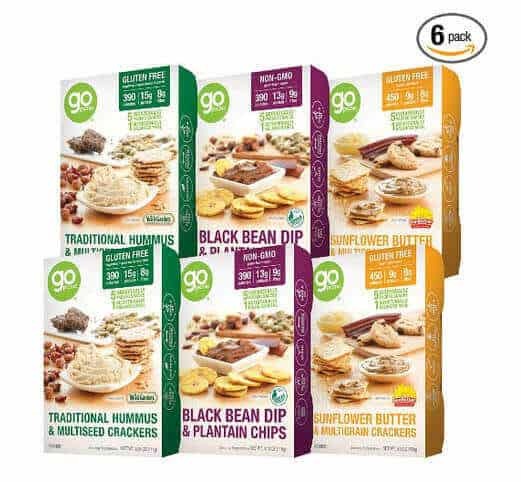 GoPicnic Ready-to-Eat Meals Tasty Favorites are just like those lunch snack packs you had as a kid but for adults! And with way more nutritious stuff that is designed to give you a healthier alternative to fast food or convenience store style snacks. The basic layout of each meal is the main dish (some kind of dip or spread with a cracker or chip) then side dishes (fruit and nut or seed blends), and a small dessert (all are chocolate). Amazon reviews for this variety pack has over 450 5-Star reviews, but this only represents a little over half of the total reviews. The big pro that many reviewers found were that these are convenient since they don’t require refrigeration and can be stored just about anywhere though some consideration has to be given to the chocolate elements in the packs which could melt if it’s warm enough. These are, for most people, a SMALL meal with all the individual components being more snack-like than the really main course and each portion fairly small. Depending on your dietary needs they may not fit the bill for being particularly satisfying. Some reviewers also found the hummus and bean dip somewhat sour, a common problem with shelf stable, savory dips because of the citric acid that is used as a preservative. Special Consideration: Some of the ingredients may come from China as one reviewer noted on the side of the seed mix that “Ingredients are products of China.” This does not automatically mean there is something wrong with the product but it may be a consideration for some.